It’s that time of year where the questions about leaves on the lawn start pouring into lawn services around the country. Questions like, “Is it okay to leave the leaves, or should I mulch them or how often should I rake them?” You would think that the answer is pretty self explanatory but we tend to make things difficult on ourselves and the great leaf debate is no different when it comes to your lawn. I once worked with a coworker who liked to make himself sound much smarter than he really was. He would latch onto certain things that he knew other people may have a hard time understanding if he used really big words and created complexities that didn’t need to exist. Leaves on the lawn were one of those things and when a homeowner or even an employee asked him if they could mulch their leaves into the lawn he would answer in a very confident manner, that mulching leaves into the lawn was a terrible idea. He would go on to say that leaves contained tannic acid and that we would never want to allow tannic acid to accumulate in the lawn. We would always take him at his word, because he was naturally much smarter than all of us, and we would not mulch leaves into our lawns and we would tell our customers the same. Tannic acid? Please with the tannic acid!!!! Mulch those leaves…..MULCH THEM ALL DAY LONG!!!!! Numerous university research reports have detailed how leaf mulching affects turf performance. 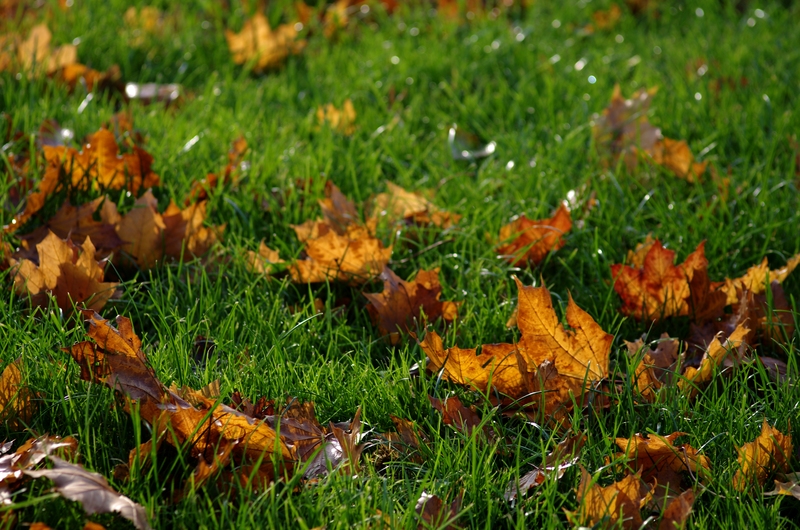 In almost every instance, the results show that chopping up deciduous leaves as part of a regular mowing schedule is an effective means of managing these leaves without harming the turf. Once the leaves start falling, elevate your mower deck to the highest setting and mow the leaves as you would your lawn, crossing over the leaves once or twice. If the leaves are falling at a slow, but steady pace you may get away with only one mulching per week, but if there is a heavy wind, you may find yourself mowing twice in one week. There will be an obvious leaf residue on the surface of the lawn that only lasts for a few days. The tiny pieces will eventually sift down through the turf and provide future weed control and essential nutrients that can save you money and time. Come spring, you won’t even notice the tiny leaf particles.